It’s easy to forget that we are part of something much bigger than ourselves. That for all the freedom we have to shape our businesses, that freedom exists within the confines not just of our immediate world, but within the limits of our Solar System, which orders everything we do. Does this sound too “far out there” to be relevant or worth remembering? It isn’t. In fact, the Solar System itself offers us a powerful model for how to manage our companies for greater success. Our Solar System is the product of countless factors, which combined to create it more than four billion years ago. For all of the many forces that explain how the Solar System works, there are three we can look to that offer useful ideas we can apply to the corporate world with practical and lasting implications. The first is the notion of orbital resonance. Orbital resonance is when two or more orbiting bodies - e.g., two planets - exert gravitational influence on each other. Orbital resonance greatly increases the influence these bodies have on one other; i.e., their ability to alter or constrain each other’s orbits. The second is the fact that most of the planets in the Solar System have secondary systems of their own, which are being orbited by planetary objects called natural satellites (or moons). The last, and perhaps most important, is the fact that the Sun, through its massive gravitational force, keeps the planets aligned in their respective orbits. The combined effect of orbital resonance, secondary systems, and the Sun highlights how the Solar System creates a natural order to things, making life, as we know it, possible. Enough science! How, exactly, does the Solar System relate to corporations? The business equivalent of our Solar System is the Value Circle - a model of corporate life that takes into account all of the relationships that make that life possible. 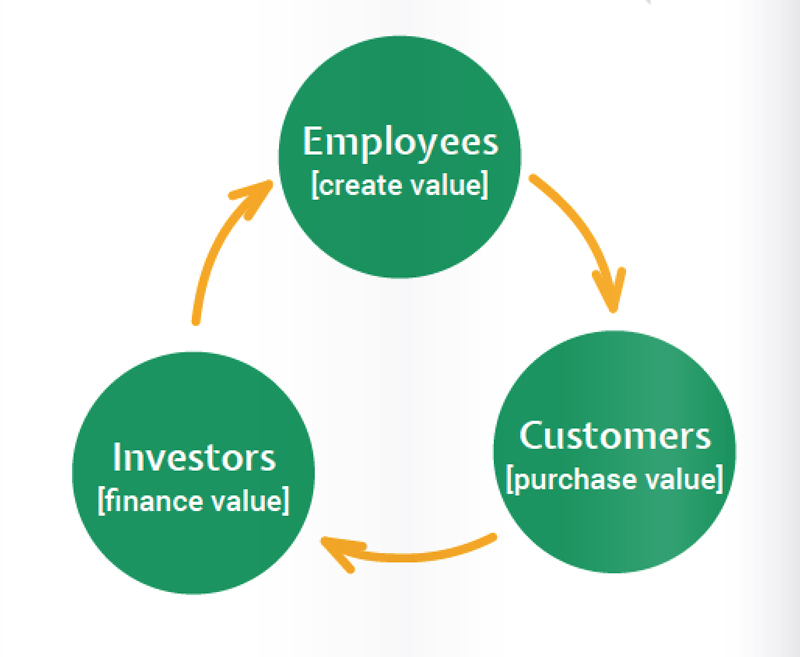 The Value Circle focuses on value creation through the lens of all stakeholders. By “value,” I refer to the proprietary contribution a company is capable of making in the marketplace and the world. At its base, the Value Circle reveals the fundamental cause-and-effect relationship among employees, customers, and investors - the central “planets” within the corporate solar system. The Value Circle illuminates deceptively simple truths about the interactions among stakeholders. One such truth is that companies don’t have a collection of stakeholders; they have a system of stakeholders - there is a natural order to them all that affects the life of the corporation. Everything begins with employees. Employees create value through their ideas and innovations, their talents, their experience and skills, and through the products and services they build, market, and sell. Customers purchase value to the extent that they like the offerings - that is, the “value” - employees create. At stake are sales, profits, and reputation. In turn, investors finance value. Depending on whether they “approve of” the earnings that flow from the value “purchased” by customers, they put capital back into the organization. This act closes the loop on the Value Circle, fueling its self-perpetuating momentum. But more drives these relationships than pure economic interdependence. Employees need customers to affirm their collective impact as one enterprise - the things they are and do as one “team.” It is as much a matter of pride and purpose as it is about a paycheck. Customers need employees to improve their businesses and lives through better products and services. Investors need employees, for they are the wellspring of ongoing earnings growth. Another truth revealed through the Value Circle is that no one stakeholder group is more important than any other. It may still be fashionable in some circles to talk about the primacy of investors, but it is foolhardy to operate that way. To do so usually means maximizing near-term profits, which can rob a company of vital growth capital. Compromising the future for the sake of the present weakens the enterprise. In the final analysis, investors are best served by seeing themselves as the beneficiaries of the value created through the interactions between employees and customers. The leadership challenge is to maximize the productivity of the Circle by keeping the interests of all principal stakeholders in balance. Smart employees need to appreciate the crucial role of investors; smart investors need to appreciate - and consciously “invest in” - the critical role employees play. Both groups need to recognize their particular relationship to customers, without whom neither value for customers nor wealth for investors is created. The “orbital resonance” that exists among employees, customers and investors is inviolable. Managing these relationships with this fact in mind is the first step towards maximizing value creation. The Value Circle not only orders relationships among employees, customers, and investors; it also aligns other constituencies around the value creation process - the “secondary systems” that directly affect value creation. For instance, suppliers are best positioned close to employees, for they have a direct effect on creating value through the parts, equipment, and credit terms they provide. The same goes for unions and government officials, both of whom influence the company’s ability to create value - the former through their effect on wages, benefits, and other work standards, the latter through regulation and legislation. In this same vein, it is easy to see how segmenting customers and investors into their component parts leads to a deeper appreciation for the role each of these groups plays in the value creation process. What energizes the value circle - what gives it its ‘juice’ - is putting a company’s identity squarely at its center - i.e., the unique characteristics that reveal the organization’s value-creating potential. On its own, the Value Circle is a powerful tool for managing vital corporate relationships. But it takes on far greater meaning when a company can see itself clearly within it. The best way to understand the power a company’s identity infuses into the Value Circle is to consider the Sun. Through its gravitational force, it is the Sun that keeps the planets aligned in their respective orbits, and it is the Sun that warms the earth, allowing us to live. A company’s identity is the “Sun” at the center of the corporate solar system. Dow Chemical’s drive to improve what is essential to human progress, AARP’s passion for helping people navigate ageless realities, State Farm’s need to ensure safe passage over time - these fundamental identities are the centers of gravity that make the Value Circle come to life in ways that are distinctly relevant to the organization. With identity at its center, the Value Circle begs a crucial question: Who must know what the identity of the company is? The answer isn’t obvious; it isn’t, first and foremost, customers. It is, rather, the employees because they constitute the physical, mental, and emotional fabric of that identity. They must know who, in the collective sense, they are - what they “add up to” as one enterprise. And then they must operate accordingly. The next most important group includes suppliers and others (such as unions) who have a direct effect on the employees who create value. Carefully designed, their products, services, and policies have the potential to strengthen the identity of the company; not just improve its operating efficiency. Another group who must understand an organization’s identity is its investors. Shareholders, money managers, and financial analysts need to appreciate ‘who’ they are actually investing in, and what the business and economic implications of this investment truly are. The situation with customers is different. For customers, experiencing an organization’s identity is far more important than the ability to articulate it. Customers need to see evidence of identity in all aspects of their relationship with it. This evidence comes in many forms: in the products and services they buy, in the return policies and warranties that measure the company’s confidence in its offerings and itself, and in the sense of loyalty customers ultimately feel in doing business with it. The main goal in working within the Value Circle is to help companies build a relationship advantage with all stakeholders, by aligning their diverse interests through the identity of the enterprise. and getting more communities, figuratively speaking, to issue a “license to operate” to the organization so it can find the most advantageous locations for its business. Building a relationship advantage through the Value Circle makes a company more efficient on a grand scale. Leaders who want to realize the many economic, business, and reputational benefits that come by managing stakeholders as interdependent parts of the corporate Solar System, should embrace the Value Circle as the most logical framework for creating value - and wealth in return. By Larry Ackerman, Senior Strategy Consultant, Siegelvision for Brand Quarterly.